The federal Farm Bill is the single biggest food, nutrition, and farming legislation in the country and is passed every five years. It sets the direction for America’s farming and food system, from farming practices to healthy food access. The current farm bill is set to expire at the end of September 2018. The House Agriculture Committee recently passed a version of the bill, which will be considered by the full House the week of May 7th. The Ecology Center, and the California Alliance of Farmers’ Markets, are disappointed in the House version. It makes drastic cuts to nutrition programs, fails farmers and farmers’ markets, and stifles conservation efforts. The House bill includes stricter workforce requirements for Supplemental Nutrition Assistance Program (SNAP) eligibility–SNAP being the country’s largest hunger and poverty alleviation program. These changes will increase food insecurity and hardship for more than 2 million Americans, including children. The changes include granting participants only a month to secure work or job training, and any “violation” of these requirements would result in denial of SNAP benefits for one year on the first occurrence, and for a period of three years for subsequent violations. On top of the devastating impacts for low-income families, these changes will hurt local food and farm economies. 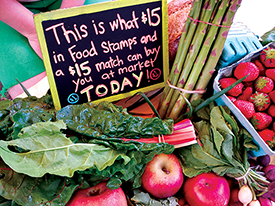 According to the Farmers Market Coalition, farmers who sell at farmers’ markets take in more than $19.4 million in SNAP sales; any reduction in the number of families participating in SNAP, also damages a very significant part of local food and farm economies. This proposed legislation cuts funding for essential programs that connect local farmers to customers, such as the Local Food Promotion Program and Farmers’ Market Promotion Program (FMPP). Farmers who sell direct to customers in turn purchase more supplies from local companies and generate three times as many local jobs compared to larger growers. FMPP provides much needed resources to increase consumer awareness of farmers’ markets, expand farmers’ local customer base, and develop new opportunities for farmers and ranchers. The farm bill has historically provided technical assistance and financial incentives to farmers who want to take proactive measures to conserve soil, protect water quality, and build resilience to extreme weather. These programs – including the Conservation Stewardship Program (CSP) and Environmental Quality Incentives Program (EQIP) – often turn away qualified applicants because they’re underfunded and can’t meet the demand. Given the increasing need to address water conservation, and mitigate the impact of climate change, the $1 billion cuts to conservation programs over the next ten years is a blow to both farmers and the wider communities who will be impacted by environmental degradation. Farmers and ranchers of color struggle with challenges including land access, adequate and fair financing options, and access to training and risk management tools. The Outreach and Assistance for Socially Disadvantaged and Veteran Farmers and Ranchers program (the 2501 program) is the one program that seeks to level the playing field by offering assistance to historically underserved producers. However, this program remains significantly underfunded. In the 2014 farm bill, the program’s funding was cut in half while the programmatic scope was expanded to include veterans. The 2018 House bill still does not adequately fund this program. The average age of farmers in America is approaching 60 years, and many retiring farmers are struggling to find young farmers to take over their operations. It is a critical time to encourage farming as a desirable career option and to invest in new producers. The Beginning Farmer and Rancher Development Program (BFRDP) offers support to new producers through education, extension, and technical assistance initiatives. It’s an essential program for the future of farming. While the House bill maintains its funding levels ($20 million/year), it misses the opportunity to create permanent funding and increase the program capacity with a greater budget. This entry was posted in Blog, Food and Farming News and tagged beginning farmers, CalFresh, farm bill, food and farming, food policy, food stamps, Market Match, nutrition incentives by Ecology Center. Bookmark the permalink.